Mithridatic Wars - Three wars were fought between the Republic and the Kingdom of Pontus, under the rule of Mithridates VI (134-63 BC). He was descended from Mithridates I, the founder of Pontus, and a mix of both Greek and Persian ancestry. Asia Minor was a front line in the Greco-Persian wars and a mingling of races was not unusual. Mithridates would prove to be a large thorn in the Romans' side and he enjoyed some success against them. The Republic had been expanding eastward for years and eventually crossed paths with Pontus, which had plans of expansion as well. It started when Mithridates tried to grab up the neighboring kingdoms of Cappadocia and Bithynia. Nicomedes III of Bithynia appealed to Rome for assistance and Rome obliged. The senate ordered Mithridates to withdraw from Cappadocia; he refused. Our primary source for the Mithridatic Wars is Appian (ca. 95-165 AD). The two sides came into conflict in 88 B.C. and the Roman army was led by eventual dictator, Lucius Cornelius Sulla. He began by attacking and destroying Athens, Pontus' ally, in 87-86. In 85 BC, Sulla was preparing to invade Asia Minor, but events back in Rome forced him to turn his attention home (see Sulla above). This was most fortunate for Mithridates who was eager for peace after what had happened to Athens. Sulla offered to withdraw in exchange for a sizable indemnity, and Mithridates accepted. As a result, he was able to stay in power but had to return to his original borders. Sulla was able to claim victory. A couple years later, Rome's legate in Asia Minor, Murena, took it upon himself to try to complete the war that went largely unresolved the first time. He sent his general, Gaius Flavius Fimbria, into Pontus without receiving authority from Rome on the pretext that Mithridates was preparing to launch another attack on his neighbors. But, after a series of inconclusive battles between 83 and 82, Fimbria retreated and Mithridates' position was secure for the time being. The final war was the longest and bloodiest of the three. It lasted from 73 to 63 BC. As in the first war, Mithridates was the aggressor. Rome responded by sending two generals, Lucius Licinius Lucullus and Marcus Aurelius Cotta, to Anatolia (Asia Minor). Lucullus attacked by land and Cotta commanded a Roman fleet. Mithridates outmaneuvered Lucullus and attacked Cotta. Without the support of Lucullus, Cotta was outmatched. Appian puts Mithridates' forces at about 150,000 (though that may be exaggerated). Regardless, he outnumbered Cotta and captured or destroyed over 60 Roman ships. Cotta was forced to retreat and wait for assistance from Lucullus. Mithridates may have become overconfident because he moved his army onto the island of Acrtonnesus on which the city of Cyzicus was built. He needed the city to resupply his army. But the move was ill-advised as when Lucullus arrived, he simply blockaded the island and trapped Mithridates. As winter approached and Mithridates situation became desperate, Lucullus attacked. Mithridates army was routed, but he himself was able to escape by ship in the heat of battle. Part of his army managed to escape as well and he had reserves back in Pontus. Lucullus then launched a campaign in 69 B.C. against Armenia to which Mithridates fled. It was ruled by Tigranes II (the Great), who was Mithridates' son-in-law and ally. This brought Rome into contact with both Armenia and its neighbor, the Parthian Empire for the first time. 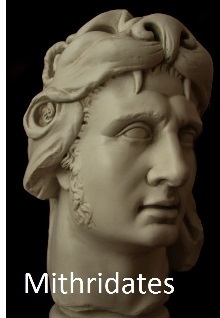 He defeated Tigranes, but Mithridates escaped and returned to Pontus. Lucullus allowed himself to get sidetracked, perhaps because of personal ambition. Rather than pursue Mithridates, he turned east and tried to conquer all of Armenia. But this undermined his troops' morale and the campaign ultimately failed. The Romans turned to its greatest general at the time to bail them out. Pompey the Great. He arrived in Asia Minor in 67 B.C. and had to start by suppressing rampant piracy. The Third Mithridatic War began its conclusion in 66 when Pompey won the Battle of Nicopolis. Mithridates fled north and was eventually killed by the Celts.